When I reviewed the Hammock Bliss Sky Bed, one of my recommendations was to add some zippered bug netting, making this a complete camping hammock. To my delight, Hammock Bliss has included mosquito netting in their new hammock, the Hammock Bliss Sky Bed Bug Free. The netting is a no-see-um mesh which has 2,000 holes-per-square-inch. The netting is also super tear and rip resistant, which is key as many similar nets are very sheer and can be punctured quite easily. This no-see-um mesh not only has very tiny holes, but it is structurally very strong and will not rip or tear under most circumstances. For those of you not already aware, what makes the Sky Bed unique among gathered-end hammocks is that it has been engineered with an asymmetric lay. In other words, the diagonal sleep position is built-in. This is the first time a fabric-based hammock has been cut and sewn with a true asymmetric design. Instead of just laying diagonally in a bed of rectangular fabric, the Sky Bed has been constructed from panels of ripstop parachute nylon fabric—almost like origami—creating a nearly flat bed-like lay. The Sky Bed is actually wider in the middle and narrower at the ends. But it’s not just the asymmetric design that makes this hammock sleep flatter, the Sky Bed has an integrated pad sleeve (made from parachute nylon) that can accommodate common backpacking pads up to 20 in (51 cm) wide and 72 in (183 cm) long. From my testing, I can say that it’s really the pad that helps the most in flattening this hammock, but the design is integral to this taking place. Pads in hammocks are often unwieldy, as the two do not conform well to one another. The Sky Bed, in contrast, is perfectly matched to a pad, thanks to its engineered body and pad sleeve. Sleeves have been used in hammocks for some time to help keep the pad from slipping and moving, but the Sky Bed also uses the pad to add structure. The hammock itself is virtually unchanged, but there are a few noticeable upgrades to some of the finishing touches. When Dov, the owner, was showing off the prototype, he described features I didn’t even know existed on his hammocks, including inner gear clips. These loops allow you to clip a peak bag, a pair of shoes, or other gear up in the peak of the hammock, out of the way and clear from the ground. The original versions had these clips in a black color, making them near-invisible. If you, like me, missed these before, Dov has changed their color to be more visible, and therefore, useful. The hammock doesn’t have a ridge line for the bug net, but this can be easily added to the gear loops in the peaks. A ridge line can help prevent the hammock from being pulled too far apart, potentially damaging the netting, but can also serve to keep the netting from falling down. The biggest change to the Sky Bed, of course, is the inclusion of the zippered bug netting. There is a zipper pull on one side that allows for easy side entry. There are two gear pockets sewn into the bug netting to accommodate small items on the head and foot ends. On the top of the netting are loops that allow the netting to be pulled up and off the hammock if needed. I found that after hanging the hammock, I didn’t need the pull-outs, since the bug netting has been cut and fitted to the hammock and isn’t loose like other models. My one minor complaint is that the zipper coil doesn’t extend the full length of the hammock. In practice, this hasn’t been a huge problem, but it does mean that there is some additional strain put on the netting fabric that could be elevated with a longer zipper and I worry about long-term wear and tear on the netting, depending on how tight the hammock is pitched and how taut the netting becomes. Another nice touch I noticed in this version of the Sky Bed is that the pad sleeve has an inner flap that holds the pad in place. In addition, there is a perfectly-placed slot for the air valve to extend out. It is a well-thought-out design and I appreciate this attention to detail. 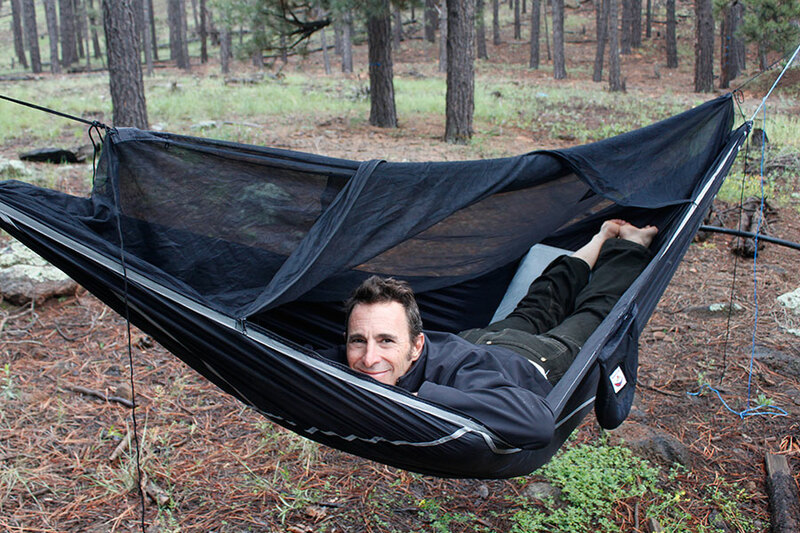 For those who loved the Sky Bed but wanted an integrated camping hammock, this is it! The bug netting really makes this a complete camping hammock, in my opinion. Next: Next post: Hammock Zipper Location: How Do You Spin? The Sky Bed looks huge. The bug netting can be very handy during the summer when mosquitos make life hard. Thanks so much for this review. I’m new to hammock camping and am looking for a good first-time hammock for my wife. She has some back issues and I’m hoping that getting her off the ground will help. Would you think this is a good choice for her? I’m not a medical expert, so please consult with your medical provider first before attempting hammock-as-treatement. It is true that a lot of folks use hammocks for back therapy. I’ve heard a lot of amazing stories, and I also benefit from pain-free sleeping in a hammock. However, prescribing one hammock over another that could be better or worse for back support is difficult. 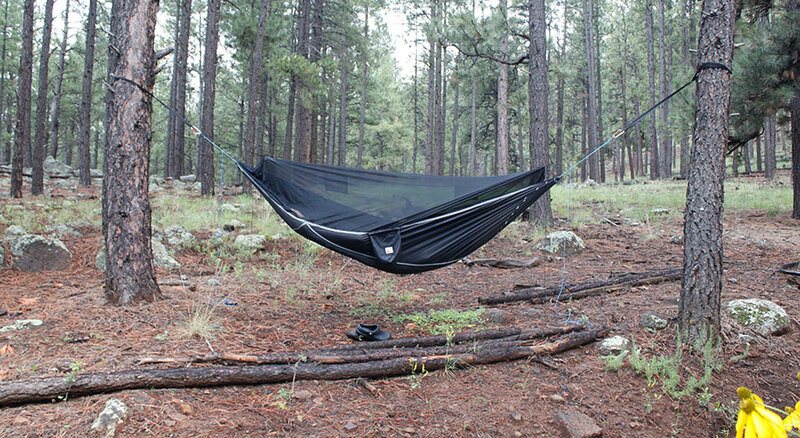 My advice would be to try a regular gathered-end hammock first, set it up correctly, and try it out. If you are looking for a really flat hammock, I would try a bridge-style hammock first. There are a lot of other factors that you might consider if you are looking for something to backpack with verses car camp verses at home. Thanks for this Derek! I certainly understand your hesitance to give ‘medical advice’. I didn’t mean to ask for it :). Just wondering if you thought that this would be a good choice for a first-time hammocker with a history of back issues. Thanks for everything on your site – it’s invaluable to us newbies. I’m curious how far can the bug net be pulled back? Can you sit up in the hammock without it in the back of your neck or face? Nearly. The netting can be pulled up higher depending I how you want to hang it. Also depends on how tight you hang the hammock. From the pictures it looks like someone 6′ or so can not lay stretched out without getting into the netting or getting off the pad.What is the maximum comfortable height? I think your assessment is correct. Hi. I wonder if you can “remove” the net and sit during the day in it as in a normal hammock, or just No-See-Um No More Hammock Bliss allows this? What are the differences between No-See-Um No More Hammock Bliss and Hammock-Bliss-Sky-Bed-Bug-Free? Thank you! You can’t flip the sky bed as you would a gathered end hammock. The bug net is designed different. Do you think an insulated Klymit V pad would work ok? My wife is concerned that the built in grooves in the pad would render It ineffective up in the air like this. I am thinking it would work fine. It will be fine. The ones that won’t work are the Klymit Inertia pads. Thanks, Derek! We are looking to try hammocks for the first time, and this looks like a good way to use our pads instead of having to buy underquilts, which are fairly pricey! The R-value will vary in a hammock due to convection. I’d get an insulated pad. Derek, To convert to whoopie slings would you go continuous loop, carabiner, slings, marlin spike? Also the structural ridgeline is okay to hook to the gear loops? It is strong enough?